This brand-new show will see Emma, Lachy, Anthony and Simon singing and dancing their way around Australia with all their Wiggly Friends; Captain Feathersword, Dorothy the Dinosaur, Wags the Dog and Henry the Octopus! Over the last year The Wiggles toured all around the world including Australia, The United States of America and Canada! The Wiggles TV show was snapped up by Netflix, taking it into over 190 countries around the world as well as Hulu, Treehouse, Universal Kids in North America and of course the ABC here in Australia. A lot of our fans also see us for the first time on YouTube with over a billion minutes viewed making The Wiggles the most successful children’s entertainment group. Get your tickets to the Wiggle Fun Tour! as quick as you can, during last year’s tour The Wiggles sold out 200+ shows! The Wiggle Fun Tour! will run from March right through to the end of the year and you might like to ‘Do the Propeller‘ or ‘E-M-M-A’ say g’day to Lachy’s friend Ponso the Pony or play ‘Simon Says‘ as well as doing the ‘Hot Potato‘ or ‘Rock a Bye Your Bear‘. Creator of The Wiggles & Blue Wiggle Anthony says “I can’t wait for our fans to experience The Wiggle Fun Tour! You’ll hear all the songs you love! The show will highlight different styles of dance that go with different styles of music. Children will see and hear drums, keyboards, banjo, guitars, bagpipes and singing. This will be our most fun show yet!” This is your chance to experience all the fun of The Wiggles show in person. Join us and be a part of the Wiggle Fun Tour! 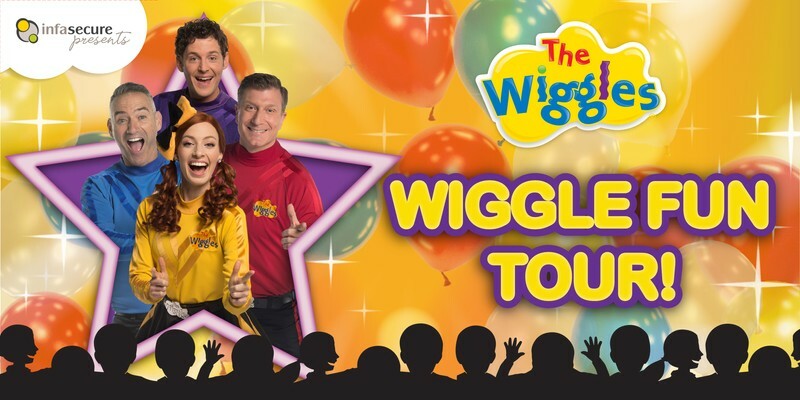 With so many sold out shows last year, you better get a wiggle on and get your tickets now as tickets to the Wiggle Fun Tour will sell like hot potatoes! 12 months & under free and must sit on a lap.